TRICHOMANIA!! What the heck is that?... I really enjoy trying out products that think outside the box. 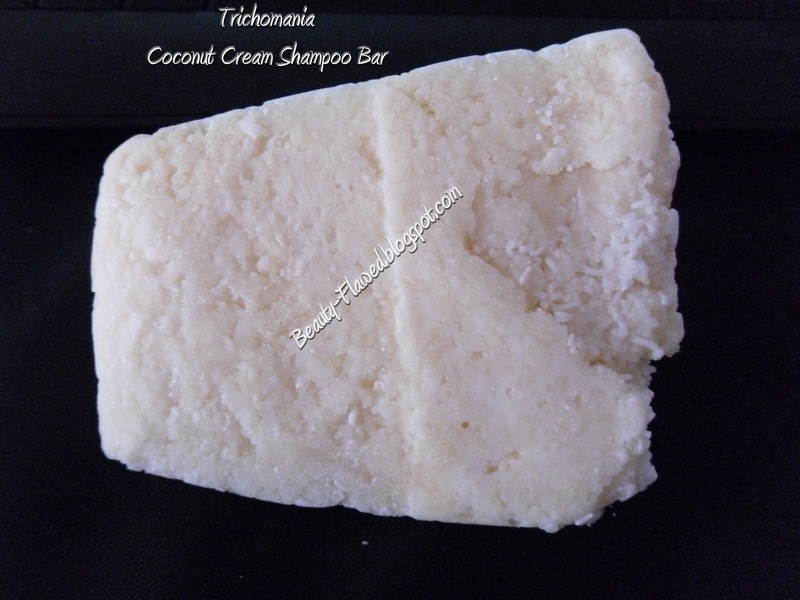 Trichomaina is one of the many solid shampoo bars in Lush's line of shampoo products. This one looks more like one of their bars of soap however and less like their familiar hockey puck-ed shaped shampoo bars. It smells like a lovely bunch of coconuts but I feel like after you get it wet it looses some of it scent. I like that its not its not an overpowering coconut scent just strong enough to smell good and once its rinsed out of your hair its nice and subtle. Using this is much like using a bar of soap for your hands but instead for your hair! Before you take it into the shower you may notice that its a bit crumbly, to fix this problem I ran the whole thing under water and rubbed it a bit like you would a soap. Once you do this you'll notice that it become more stable and solid and less crumbly. You can also cut this bar however you like to help persevere what you don't want to use right away. I have found that it does not lather well when your just rubbing it against your hand, the trick with this is to actually swipe it across your hair a few times and then use that to work through your hair into a nice lather. The lather itself is very soft, fluffy, and creamy feeling and really rinses clean. Since using this product I have also noticed that my scalp does not feel as dry. When rinsing it out I have noticed that it feels almost too clean and tangled but once I add some conditioner this feeling quickly dissipates and its business as usual. This product is almost like a two in one shampoo and conditioner and is recommended for thick, curly, or wavy hair, but because of its dual purpose I think it would be great for most hair types unless you have a oily scalp that is the only complication you might find with it. I have been using this for over a week now and it has left my hair feeling soft, volumized and with serious shine power. I think I'm most impressed by how shiny it has made my hair. I have curly hair that's past my shoulders and no matter i do it seems to always be a dull mousy brown color, well not anymore thanks to Trichomania! Ingredients: Sodium Lauryl Sulfate, Stearic Acid, Creamed Coconut (Cocos nucifera), Glyceryl Stearate, PEG-100 Stearate, Cocamide DEA, Lecithin, Perfume, Vetivert Oil (Vetiveria zizanoides). It does contain sodium laurel sulfate, I have used products without sulfates but to be honest that really isn't a deal breaker for me anymore my hair feels the same with or without it. You can pick up 3.5oz for $9.95 on the Lush website or if you go into the store you can have them cut you any size you want bigger or smaller. 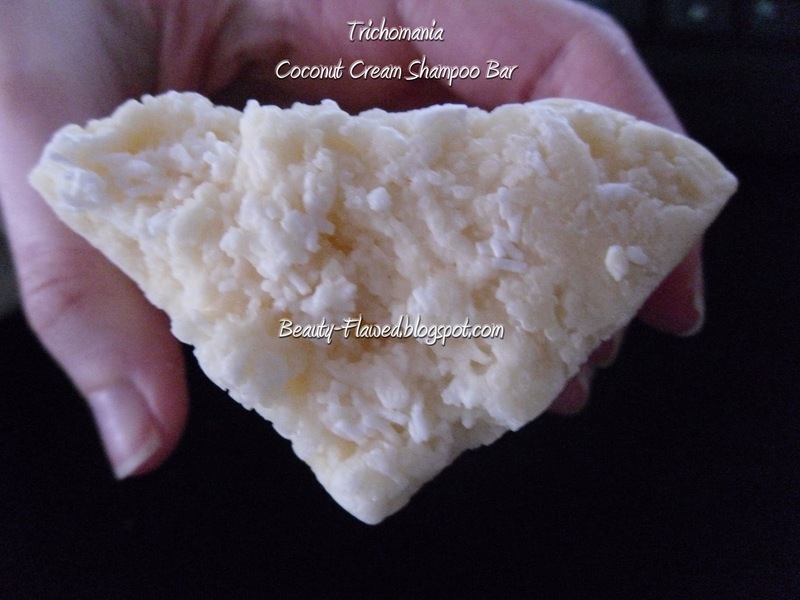 Overall I really like Trichomania and I would definitely buy it again. I love the way it leaves my hair super soft and shiny and it works great. I have used it about 7-8 times now and it really has not gone down in size any so I see it lasting longer than your average shampoo. I'll update this when I run out!